The route between Montreal and New York is very scenic, first following along the edge of Lake Champlain. In order to avoid the chaos of New York City we stopped in Schenectady and stayed at the Stockade Inn, a beautifully restored old building that used to be a gentleman’s club. We walked along the river to stretch our legs before having supper in the downtown area at Aperitivo Bistro. 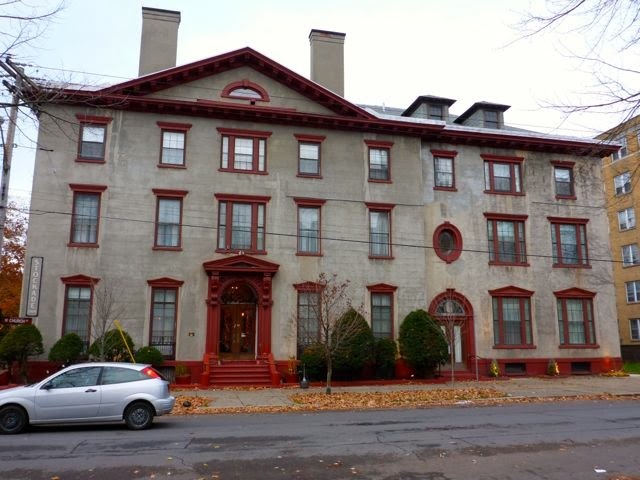 Stockade Inn -- doesn't really look like a hotel from the outside! The next day, following the Hudson River into New York was definitely the most scenic part of the trip. Although well into the fall season, there were still lots of trees with brightly colored red and yellow leaves and several areas of dramatic cliffs. Penn Station was a zoo! It took a while but we finally found where we needed to be to catch the train heading south. We overnighted on the train and spent the day in Savannah, another city we really enjoy for the trails along the river/port area and the significant amount of green space provided by all the city squares and parks. (See Andrew's photos.) 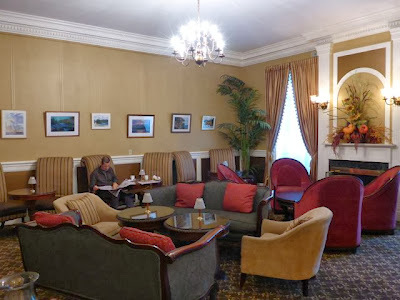 We again stayed at the Planter’s Inn and had another very tasty supper and great service at the Sapphire Grill. For some reason we both thought we had a second full day here and made plans to rent a car and head out into the surrounding countryside. Fortunately we figured out our mistake in good time and caught the train to Miami early the next morning. 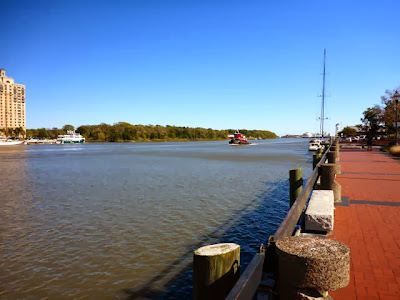 Savannah is a fairly industrial and busy port but there's also the tourist paddle wheelers and large tourist yachts. Note the very tall mast of a racing sailboat on the right of the photo. 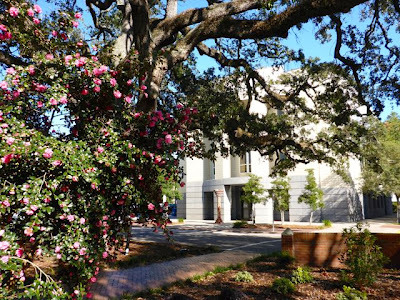 Flowering bushes and large old trees with branches stretching over the roadway in Savannah. 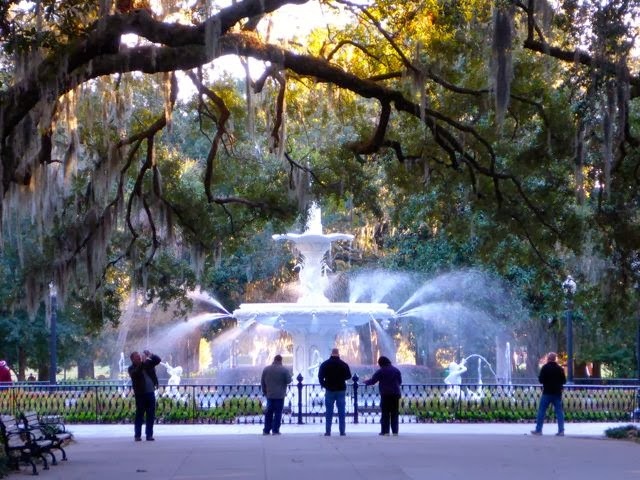 Savannah was going through a bit of a cold spell so it wasn't until we got to Florida that shorter pants and sandals could come out and we could ditch the jackets. 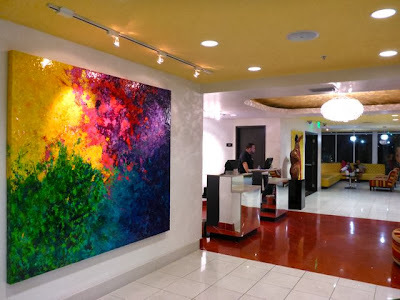 Our train was late getting into Miami so by the time we got to the Urbano Hotel it was almost 10 p.m. There was loud music and an art class going on in the lobby. The whole hotel is brightly decorated. A very unique place to stay! 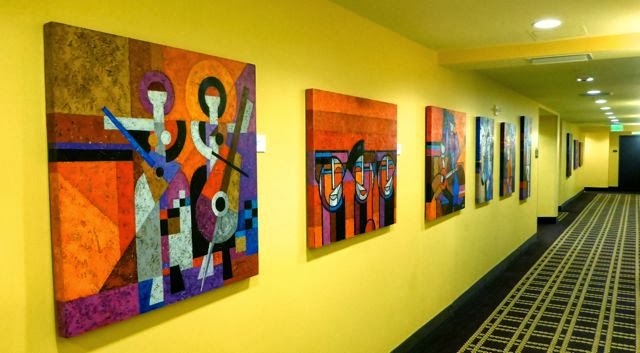 Paintings line the walls throughout the hotel. We chose the hotel based on it's proximity to the aquarium. 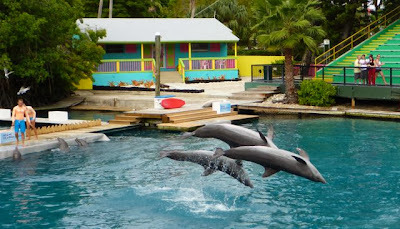 The Miami Seaquarium is the oldest aquarium in the U.S. and unfortunately is showing it's age. 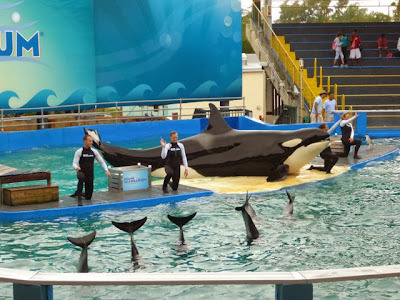 Although we're always impressed by the shows that are put on, we also wonder why the animals are in captivity and how good it is for them to be so integrated with human beings. White-sided dolphins and killer whale. 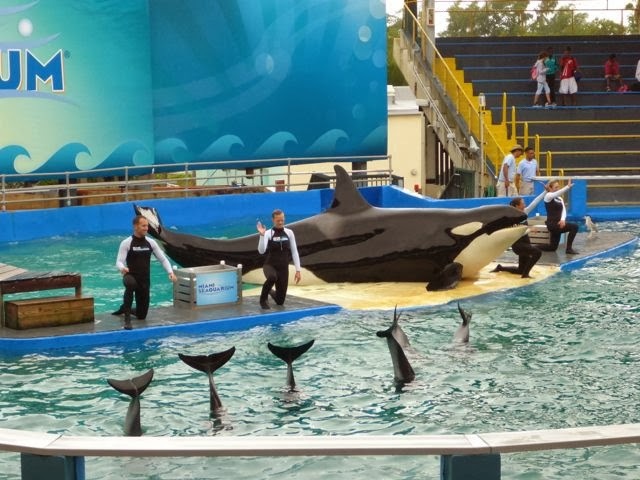 Yes, that whale on the platform is real! 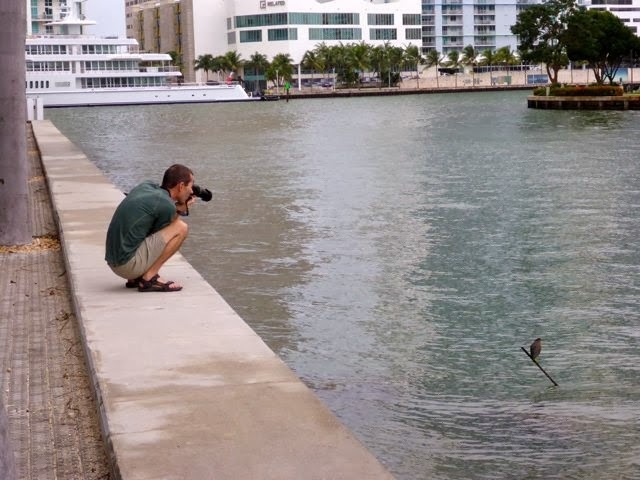 Later in the day, near Brickell Key, Andrew found a cooperative photographic subject. Now we are off to the Bahamas and a couple weeks of diving! !